After a solid stretch of in-house releases, Nomad has returned to its collaborative roots with a pair of beers made with San Diego’s Stone Brewing. And, to give things a bit of extra American gung-ho, they’ve branded both with a Top Gun theme. 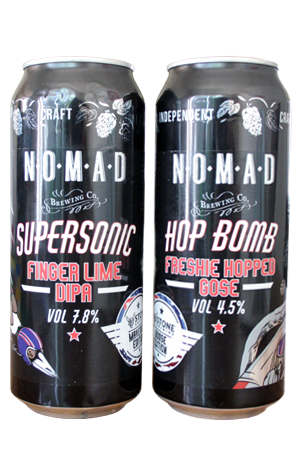 The first is the Supersonic Finger Lime Double IPA (codename Maverick) and it’s an adaptation of Nomad’s Supersonic DIPA but this time with the addition of finger limes and featuring a fairly recently developed hop variety from the Yakima Valley: Loral. Despite this, one of the most immediately striking things is how much the malt comes through; you might expect to be met with a knockout hop hit but are instead sucker punched with a mellifluous, honey-like sweetness. Of course, the hops are on display by way of a citrusy, pineapple and tropical fruit juice sensation before those Loral hops round things off with a lemony and slightly herbal character, plus a touch of spiciness. The finger lime isn’t as prominent as you might expect it to be, but that’s not necessarily to the beer’s detriment. Coupled with relatively little bitterness and that pleasant sweetness, Maverick hides its 7.8 percent ABV so that it sits comfortably in that 'dangerously drinkable" category. Popping lots of hops into a gose isn’t a particularly typical thing to do. Then again, if they brewed according to convention, they’d probably never have gone to the trouble of wading into Freshwater Beach to put seawater in the original Freshie, let alone bothering with the native ingredients they throw in. So it’s presumably with that slightly contorted confidence that they decided to use the same hop varieties as they put into Maverick, albeit in a necessarily lesser dosage for a less robust beer. What that’s resulted in is something that carries loads of lemony sherbet character in the aroma and on the palate. In between there’s wheat, coriander, citrus sweetness and even, perhaps, a gooseberry character coming together. Goose isn't a beer that shows outright sourness, but there’s certainly a tang and, just like the beer that was its genesis, this is every bit as light, refreshing and interesting.